The winners of the Xi’an Animal Naming Contest have been chosen! The Lore team was overwhelmed with creative, interesting, and well-constructed suggestions. Thank you to everyone for your participation. We were extremely impressed. 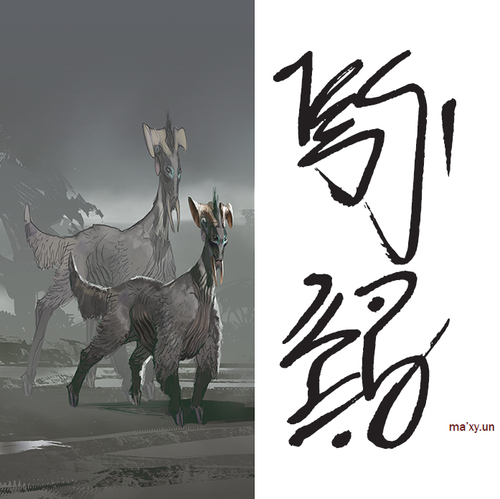 The ma’xy.un, known as a Shoone in UEE parlance, is a tall, herbivorous beast bred for its fine wool. We picked ma’xy.un due to Benjamin Hopp’s clever combination of ma’a, which is the elemental compound for an animal, and a tai of his own making, xyun, which means chew; chewing (typically in a ‘crunching’ manner that makes noise); masticate; grind. His suggestion also showed understanding of the order in which Xi’an words need to be combined to create complete thoughts (though we modified it a little in the end). Excellent work! It is completely plausible from Benjamin’s line of thinking that the early Xi’an who first shepherded these beasts would name them after the pervasive (and perhaps annoying) crunch sounds they make all day. It’s also plausible that the deep etymological meaning of their name isn’t obvious even to most Xi’an. So, although the animal is technically called a “cruncher,” Xi’an wouldn’t think of it in that context. maTuēl – “Animal of the house of Tuēl,” suggested by Kiv0. We liked it because the idea that an animal would have a brand name seems to fit well with the importance of Houses in Xi’an culture. 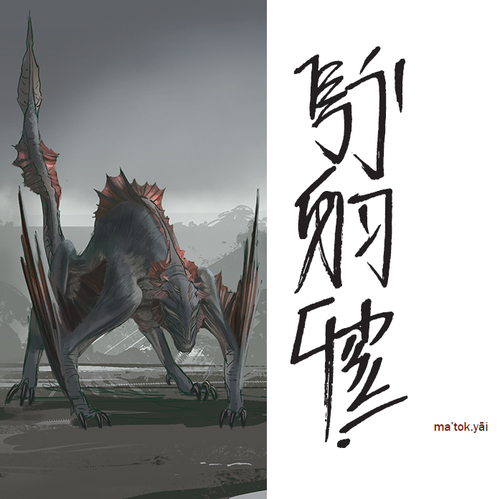 The ma’tok.yāi is a predator native to the Xi’an world Xi (Rihlah V). It glides from tree to tree, using its formidable claws to latch on to unsuspecting prey. Speakers of UEE standard refer to the beast as Tokyai. We picked Kiv0’s suggestion not only because it was well-made according to Xi’an grammatical rules, but it suggested a sense of fear in its pitch construction. It was an inspired idea, and one that had no trouble standing out. With this suggestion, Kiv0 captured both our imaginations and coined a word that fits smoothly into a Xi’an etymological mindset. It is a descriptive label meaning literally “animal that creates genuine fear” and evokes the Xi’an experience of being in a forest on Xi as the creature enters the local canopy. The other social pack creatures begin to make warning howls to their troupe-mates. “It is near, it is near.” The solitary beasts all go silent in the hope that it will not notice them. The prey animals are all terrified that they are about to be eaten. The Xi’an, as omnivores, are not much to the ma’t.ok.yāi appetite, but they can still sense the terror that it spreads over the sylvan environment that it dominates. It also follows the same combinatorial model of nya’t.ot’en (farmer = “person who creates food”), but very properly begins the with ma, which means that the Xi’an do not consider it a person (nya), but rather a part of fauna, a creature or beast. Tyā t.u – “benevolent predator” (although the grammar is backwards), suggested by Kalran. We liked it because it was one of the only positive descriptions of the predator! We like the idea that the predator would hold a level of reverence within Xi’an culture, even though it’s still dangerous. Humans call this little guy the yengi or yengi cat, though it’s more properly known in the Xi’an language as a ngii. It’s a semi-aquatic domesticated mammal that’s lived alongside the Xi’an since they first developed farming. It’s also their most popular pet. We picked ngii for the animal’s proper name, based on Jale’s suggestion that an animal so old would have a simple name. His choice of ngii was also very Xi’an-sounding to our ears. We picked yao’yao as a nickname for the animal for similar reasons. o ki’a loa .u Ngii Y.āth – Yath eats like a Yengi – Yath eats quickly and quietly. e run nai’yeth e Ngii Thl.oan – Thloan has the deep knowledge of a yengi – Somewhat sarcastic. Yengi aren’t especially smart or wise, but do sit in your house all day watching you. So this implies that Thloam is a gossip, obsessed with the personal lives of his peers. Nemi, suggested by Widde. It’s a new tai, which we like because the animals from the homeworld would likely have simple names with fuzzy origins. 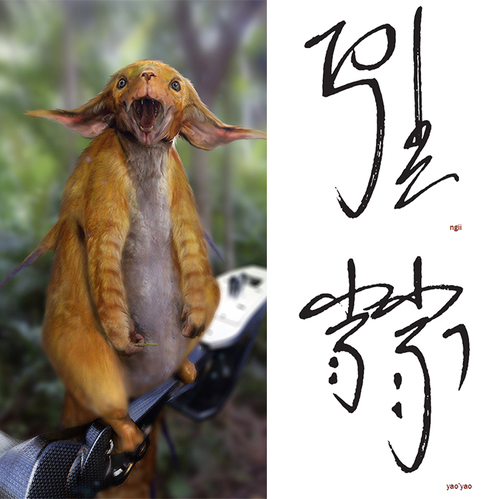 kuthlūn, suggested by Bearclops, intuited that phonologically kuth + thlūn would naturally produce kuthlūn in the Xi’an language and semantically the meaning is very appropriate for an adorable pet. Technically speaking the term would more likely start with ma (animal), but in the context of a domestic situation that ma could very easily drop. Kuthlūn would be a GREAT given name for your personal ngii / yao’yao, if you are ever able to acquire one. Tomodachi Life: The Sims Meets Animal Crossing? Hard Boiled Brood: “Dragon” Egg Decoration Contest! Savage Swords and Noble Staves: it’s time for a RIFT concept art contest! RIFT Egg Decoration Contest: The Winners!